Critically acclaimed international stage sensation Whitney – Queen of the Night is to get its West End premiere with an exclusive performance. It is announced today the stunning celebration of the music and life of one of the greatest singers of our time will be at The Savoy Theatre on Sunday March 24. 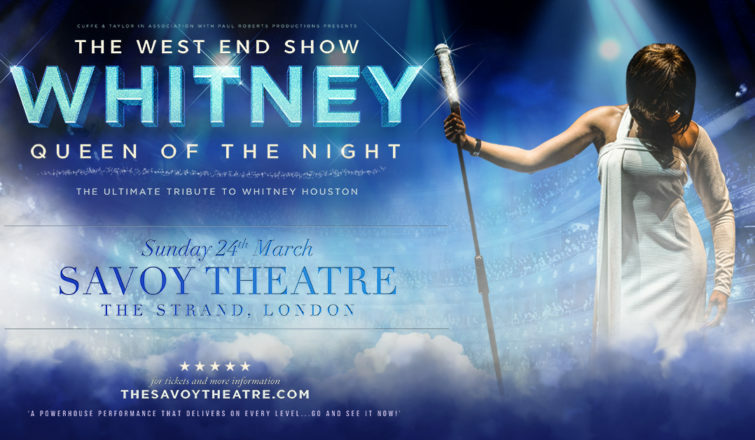 Whitney – Queen Of The Night will star Elesha Paul Moses (Whitney – Queen Of The Night tour, What’s Love Got To Do With It?, The Voice, The X Factor) in the title role, supported by a stunning live band. The outstanding concert production has toured extensively across the UK and Europe for the past three years and promoters Cuffe and Taylor are delighted to be giving the show its West End premiere. The Savoy audience can enjoy three decades of nostalgic hits, including I Wanna Dance With Somebody, One Moment In Time, I’m Every Woman, I Will Always Love You, My Love Is Your Love, So Emotional Baby, Run to You, Saving All My Love, How Will I Know, Million Dollar Bill, The Greatest Love Of All, and many more. Speaking about playing Whitney Houston, Elesha said: “I am absolutely thrilled to be bringing Whitney – Queen Of The Night to the West End. It is a magnificent show, celebrating the life and music of a phenomenal performer. Before her death in 2012, Whitney had been hailed as the most awarded artist of all time, by Guinness World Records – with six Grammy Awards and 30 Billboard Music Awards among her 415 titles. Whitney – Queen Of The Night is an unmissable evening paying homage to one of the best-selling music artists of all time, with a sensational cast and a stunning live band. Disclaimer: Please note that this is a tribute production and is not affiliated or endorsed by the Whitney Houston Estate.